I love to play, I love girls, I am a good boy who will be an excellent guest. That is my goal. 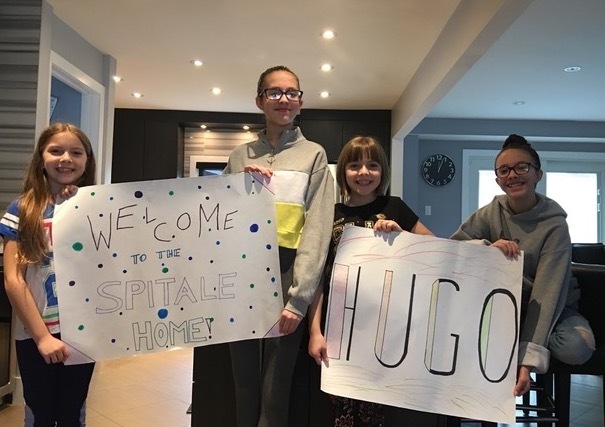 The girls, when they came into my house, (they came to my house! the joy!) I was so excited I did not know what to do with myself, what shoe to grab and show off, who to see first? Six new people in my house and 5 of them were girls! A whole week, that’s what I hear them saying, they are going away, I see a suitcase. A whole week of girls and Vince. I love Vince. He holds my paw. I love holding hands. My life is all about play. My best friend is Kenny and Ilona is his mom. We play hard many mornings, running and fighting all around the park. It would be nice for me to see Kenny and do that, but really, it’s not essential. It really isn’t. 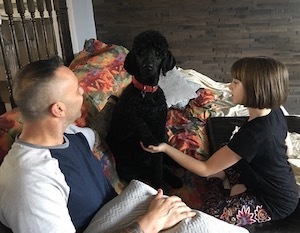 That’s a thing about poodles; we love to run and play but we also are deeply contented to be at home and snuggle. Some mornings I can just go out to pee in the back yard, have my food, then go back to sleep. It’s hard for me to accept, but I am not in charge, the humans are. They have things to do that don’t involve me. I wonder if I’ll see Vince much. This was his idea, my visit, but I’m pretty sure it will be Kim who takes care of me. She has so much to do. It will be lots of fun to follow her all around the house. I look like I’m asleep but I’m always alert. I am very good at not running downstairs on the heels of the humans. I may need reminding, and I do want to be a good dog, so tell me “Stay” at the top of the stairs and I will. Be sure to call me when you reach the bottom and I’ll come tearing down. Whose bed will I sleep on? What are their couches like? I’ll bet there will be shoes and slippers, lots and lots of shoes and slippers! I will get to see Portia/oops! Porsche? I like her; she likes me. We run. She doesn’t much like other dogs but she likes me. All other dogs like me. I am dominant but not aggressive. I like people, too. Except for Adam. I don’t like Adam. I don’t know why. All I want to do is growl and bark. I was a little happier with him when he gave me some of my favourite liver treats. I suss out other dogs. I stand and look, stand and sense, check it out and see if it’s someone/some dogs I know. My eyes aren’t all that great but my nose knows and so do my ears. I don’t want to get to know some dogs. I love Blue. Jennifer and Bill belong to her. 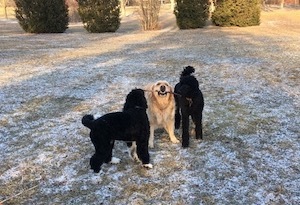 We three, Kenny, Blue and I play and play. Sometimes I get jealous when Kenny and Blue are ignoring me and I bark and bark at them. It really annoys the humans. After walks, especially snowy or muddy walks, I need to have my paws cleaned. My mom stands with the towel; I sit. I put my right paw up. (my mom calls it “Your right paw” – Where is the wrong paw?) When that’s clean, I put up my my left paw. (she calls it “Your other paw.”) Then I turn around, (sometimes I need the encouragement of being told “Back Paws”) and I put up my left one first, then the other one. Usually I’m still a bit wet so I have to stay on the mat by the door. I know what “Down” means but sometimes I just don’t want to do it, but I must. I am a good dog. food – after being outside in the morning – 1 1/2 cups of the kibble and the same in the evening. I get a little snack – about 1/3 of the cup around noon. I’ll bet I’ll be eating lots of treats so maybe I should have just 1 cup morning and night. after the evening food, I always get a special treat of a pig ear piece. Really crunchy, but gone in a flash. I always ask for more. Sometimes I get one, not always. Sometimes I get a cookie, too. I hang around the kitchen (oh, that’s what I’ll see Vince!) at dinner time. I’ve perfected a mournful, needy look that used to get me a treat but it’s not so effective anymore. She’s on to me. It may work on new people though. I love meat, raw scraps of beef, chicken, pork – meat! I’ll sleep anywhere. I do like beds so maybe I’ll get to sleep on lots of girls’ beds. One day I lost my mom in the park. I did not know where she went and I got so worried so I went home and waited in the driveway. Eventually she came up the path and I stood in the driveway and barked and barked until she got there then I jumped all over her. She came home! She wasn’t lost! 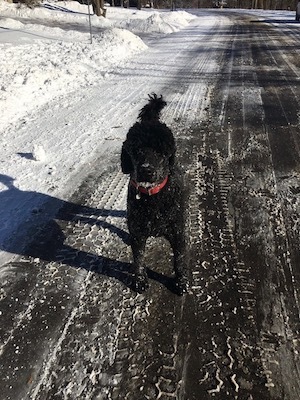 My mom just sent an email to the moms and dads of Kenny, Blue, Ollie, Cooper, and Flynn and told them if they see me all alone on the driveway to tie me up in the back yard and text you with a message that I am found and am at home waiting for you. I’ll guard your house. I’m very good at barking really loudly. I do have to be told to stop. I’ve turned onto a much more protective poodle since she came home from the hospital and couldn’t walk. I need to protect her. I’ll protect you, too. But if you tell me it’s all OK I’ll stop barking when the people come in and I’ll find a nice shoe or toy to give them. Will I miss my mom? Will she come home? I don’t know but maybe if you send her pictures of me to remind her what a good dog I am she’ll want to come home. She told me it was a holiday for me, whatever that is, and I know I’m going to have lots and lots of fun with lots of girls and I think she usually tells me the truth. When I can’t go with her and have to stay home, she tells me that she will be back and to “Guard the house!” I like having a job. You can tell me to guard the house, too. I will be a good dog but I’ll probably chew lots of slippers. It’s year end and I have not written a word here since my yarn sale. It went very well, thank you! Most of all it was fun, lots of fun. A few people suggested an annual event with lots of yarn sellers and yarn buyers. (Admit it, we are the same people). I love that idea, especially with a show and tell display – projects made from the yarn we bought in previous years. It would be inspiring to see another’s creativity at work with what no longer inspired us. To everyone who came – thank you! And many thanks to my friend Kim. It would have been chaos without your enthusiastic and knowledgeable help. See you next year for a group sale. If you live nearby, start setting aside the yarn you’re not sure about now. I’ll send out a plan early next Fall. 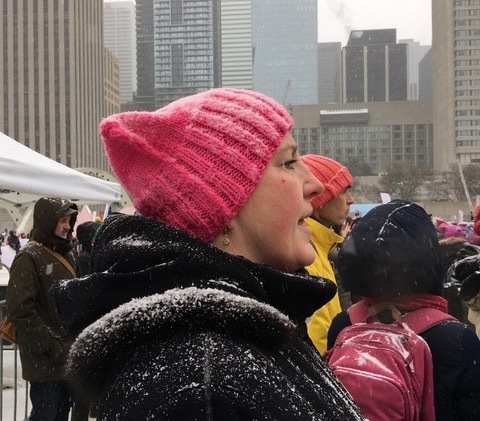 What are Those Toques? Lots and Lots of Toques! A word to those in other countries, toque = beanie, although to be a toque it must stand up to cold Canadian winters, not be a fashionable skullcap, not that fashionable skullcaps aren’t simply adorable. 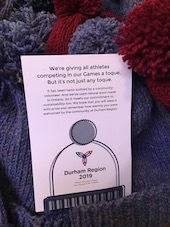 Hence, the warm looking toques you see above are for participants in the Ontario Parasport Games taking place in Durham in February. As is usually the case with these things, someone told someone who told more someones and quick as can be, all 400 skeins of yarn were gone to knitters across the region. Our new knitting group managed to get at least one for each of us, 18 of us, and we volunteered to knit more, too, including the red ones to sell to games attendees. We made lots. I didn’t count how many. Brand new knitters in the group made toques for their very first project, so impressive, and others used the toques to reacquaint themselves with the craft after decades-long lapses. There was teaching, learning, laughing, pom pom creation, and pride. 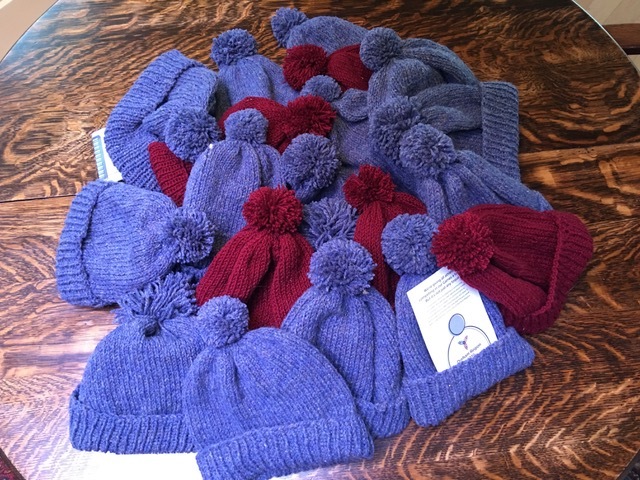 Included with each toque were these postcards, with a personal note from each knitter to the athlete who will wear it. We were all delighted. What a pleasure for us all and what a terrific way to launch a knitting group, making something for the community. For Christmas gifts, we made Tricksy Knitter’s Leafy Washcloth, a real skill builder, a chance to try out cotton or linen yarn, yarn without the give or bounce of wool. Next we’re making something for ourselves, socks, two at a time on circular needles. I’ll be sitting and taking instruction for this project. I’m not a sock maker. I made one once (yes, just one). 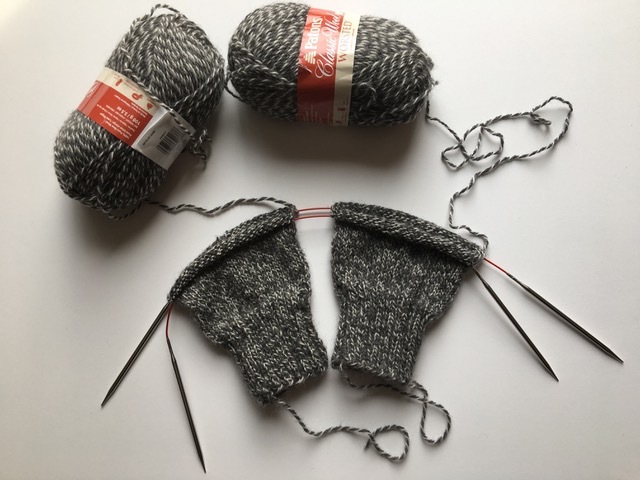 One of the experienced among us suggested this as the next project – begin making socks two at a time and we’ll never have to suffer second sock syndrome. We are all game. Brave new knitters! Happy New Year! I’m wishing for you in your homes and your hearts what I wish for the world – less war, more sanity, less fear, more fearlessness, more compassion, care and understanding for the vulnerable. And for the makers, learn something new in 2019 and teach someone something new. So this is the very last post about my yarn sale – I promise. 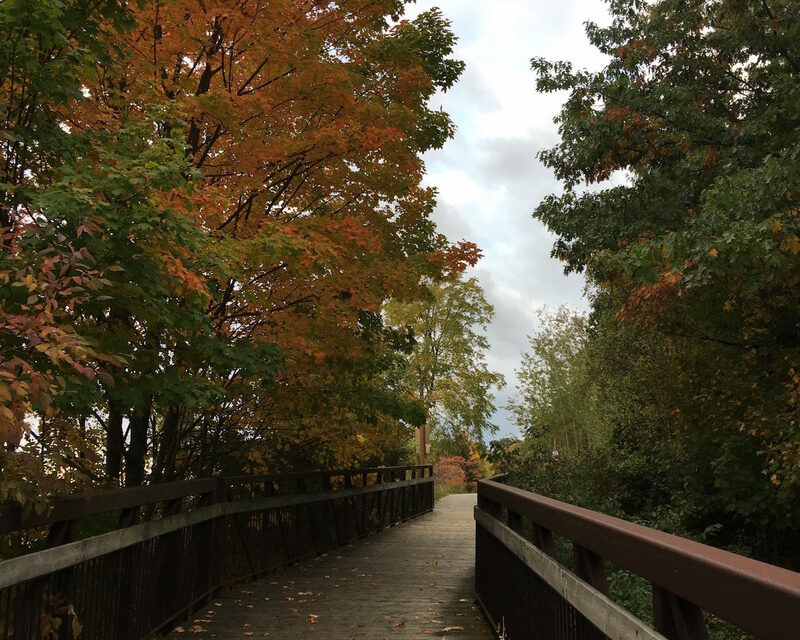 The picture is the bridge near my house. 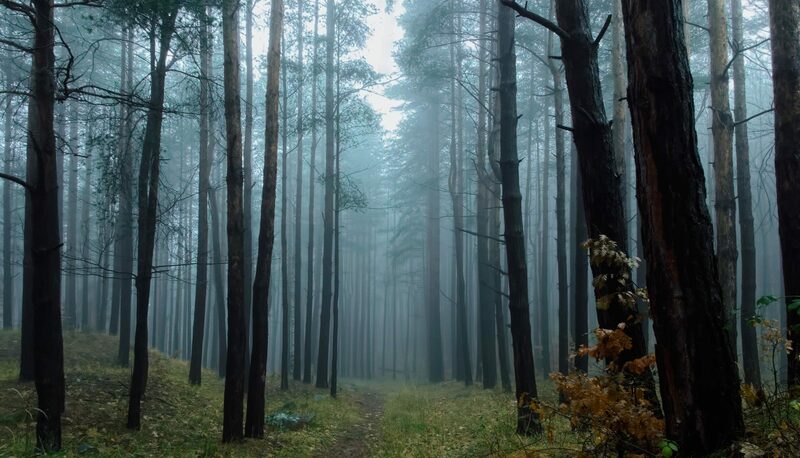 You’ll see that if you come to visit and take a walk. The list of what I have for sale and all the details are below. Questions are welcome. Will I shut up about this now? Yes! I laughed and was totally charmed by this very personal reaction to my yarn sale announcement last week. I first met my correspondent, Jonty, at a YarnOver SleepOver Retreat 5 years ago. 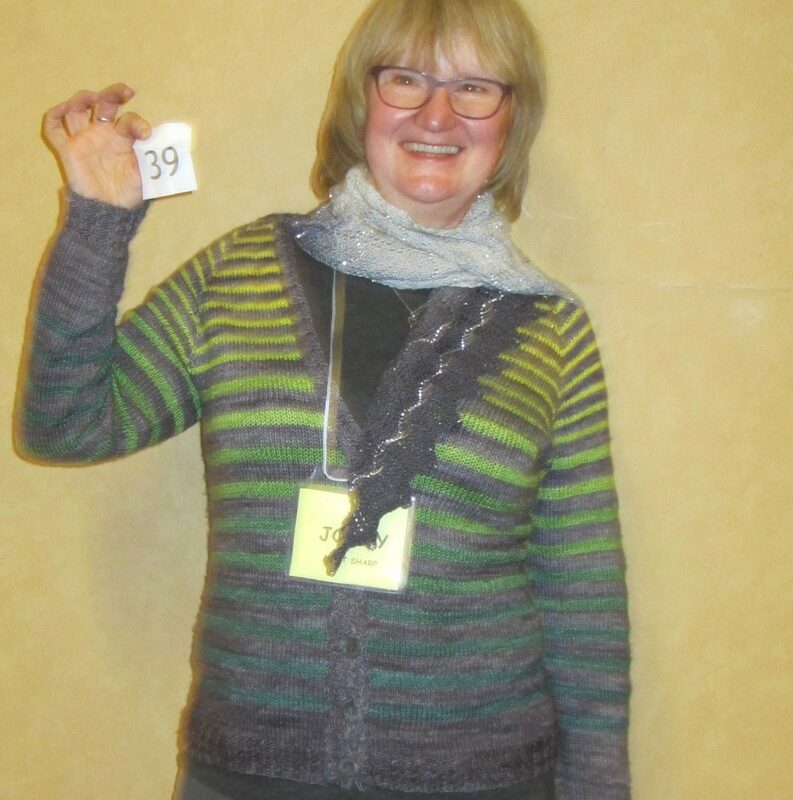 She is an amazing knitter, hilariously funny, and can be counted on to model enticingly in the Saturday night Fashion Share. And she uses the word “accoutrement”. Love that. It’s time for me to unload yarn that is weighing me down. 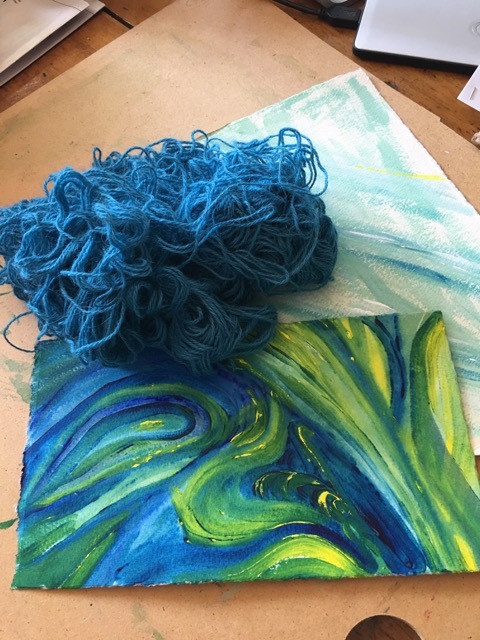 Non knitters and crocheters (there are some who subscribe to my blog) may find the idea of something as light as yarn as a weight, but that’s how it feels. Something major is changing in my life; I’m not exactly sure what the change is and where I’ll end up, but I need space. I need space in order to make a new space for whoever the new me is going to be and whatever the new me is going to do. There will be knitting, just less. I’m not quite ready to donate my yarn, I’d rather have a true bargain of a sale first, invite all the knitters I know and the ones that they know and try to recoup some of what I’ve spent over the years. I’ll donate what’s left to the Textile Museum in Toronto. I had a yarn sale when we moved houses 6 years ago. It was releasing, fun, and I met fellow knitters with whom I’m still in touch. Please come if you live nearby. Bring your friends. Send your friends. Feel free to send this along to anyone you think might be interested. Email me if you’d like more information. See you then, I hope. There’s a Squirrel on My Bed! My husband and a red squirrel have an on-going battle for dominance in our back yard. Invariably, the red squirrel chatters his displeasure when anyone enters his domaine. There’s a pathway that runs from a nearby walnut tree. Said squirrel uses it as his/her main transport route to secret places in Brian’s wood cribs. 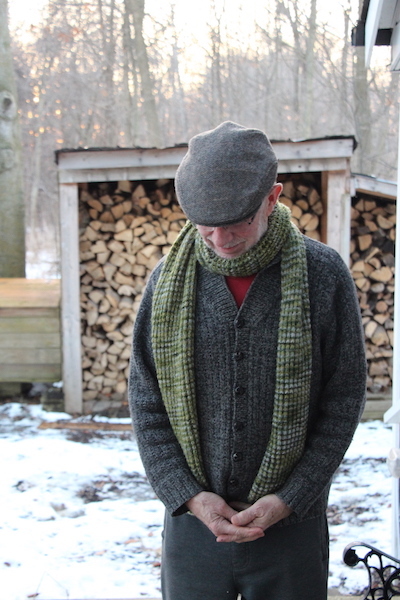 We heat with a wood stove – my site is called Knits From The Woodlot for good reason. Wood cribs are essential to protect the gathered, cut, split, and stacked bounty of maple, ash, and apple to allow it to dry before burning. Someone loves to chew holes in those wood cribs and find unique and secret ways to store walnuts for a long hard cold winter. His arch enemy, the man, rails against this practice, destroys the caches, and limits the opportunities. Well, tries to limit the opportunities. The score so far, several years in – red squirrel 1, man 0. The husband needed a duvet cover and I found fantastic cotton material. While on this shopping venture with a friend, and after telling her about the on-going battle with said red squirrel, she spotted this wee cushion. Perfect. I bought it. 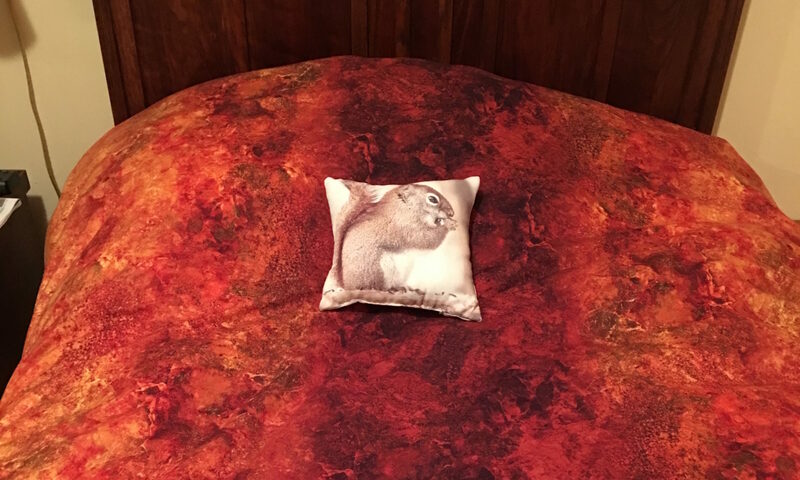 We made a plan – I would make the duvet cover and place the squirrel just so for a surprise. 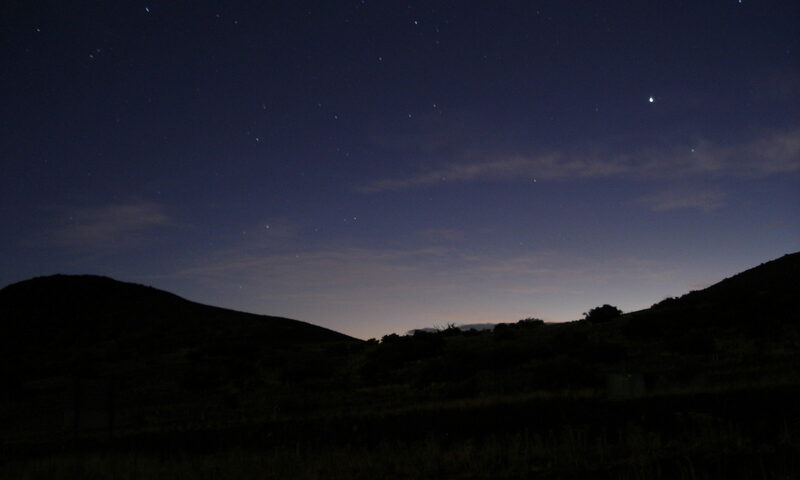 What you see at the top of this post is what he saw when he flipped on the light. Great trick. He laughed; he shouted, ‘There’s a squirrel on my bed!” I laughed. He shouted again, outraged, “There’s a squirrel on my bed!” We both laughed. So much fun. The cushion wasn’t banished. It was last seen squished under the man’s head. The score last night – man 1, red squirrel cushion 0. I just love fibre creations that make me gasp! On Stargazing: A Knitted Tapestry, you’ll see constellations from the entire sky, machine knit by Australian software engineer, Sarah Spencer. Simply miraculous. Her last project was a baby blanket. Tapestry stats – 9′ (2.8m) tall/15′(4.6m) wide/33 pounds/100 hours/ Click the link to appreciate the scale of this project. Sarah designed an algorithm that could translate pixels into stitches in one of three colours – blue, grey, and white. “It wasn’t a perfect science” she said. I’m sure she knows best, but it looks pretty perfect to me! The inherent fuzziness of yarns throws off the perfection. Stargazing: A Knitted Tapestry consists of locally sourced Australian wool that matches the blue color of the outfits of the accomplished Australian women depicted in portraits… Sarah Spencer wanted her universe to be “dressed in a similar ultramarine blue to celebrate the achievements of all women in the fields of science.” Brava! Also from Australia is crocheter and artist Trevor Smith. Smith crochets platters of food – lobster, cheese platter, ham, cakes, fruit, all just glorious. Trevor comes to this through a circuitous route familiar to all fibre artists. His mother taught him to crochet as a child. A degree in sculpture followed by quilting and patchwork lead to three dimensional crochet. It’s not just food – check out this page to see a mixmaster, sewing machine, and a retro record player. It’s too bad I can’t use the images, but follow the links and you may gasp, too. 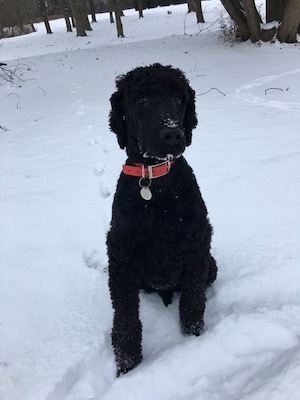 This blog is definitely off the topic of knitting, although there is a picture of the yarn eating poodle’s manipulations with a previously tidy ball of alpaca. Doesn’t he show impeccable colour sense in coordinating with my play-around-art? 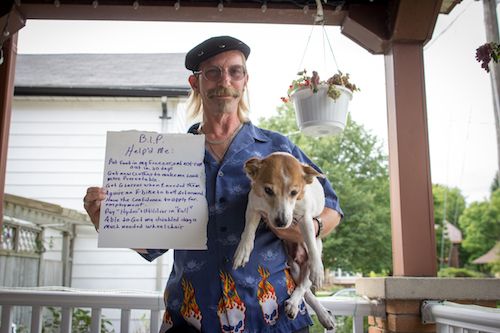 The topic is a Humans of Basic Income GoFundMe campaign that I started. 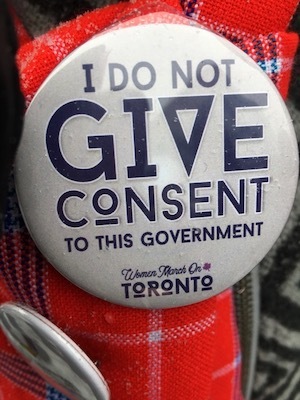 Here’s some background for those of you in other countries and provinces. 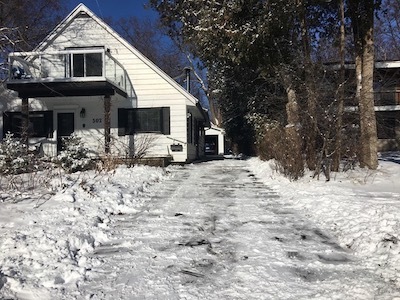 A year or so ago our Ontario government launched a Basic Income pilot program with the goals of determining “whether a basic income can better support vulnerable workers, improve health and education outcomes for people on low incomes, and help ensure that everyone shares in Ontario’s economic growth.” 4000 participants were committed to this program and invested time and money into their lives, homes, and education based on the 3 year time frame. We had an election. The party that won had promised they would retain the program but cancelled it as soon as they took office. I was outraged. Many people were. 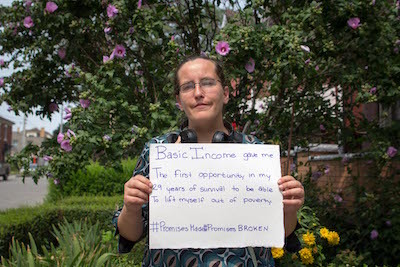 A young woman, Jessie Golem, a photographer who was a participant in the program and benefited from it, started Humans Of Basic Income. She thinks it’s important to tell the stories and ensure that the program is completed through to the evaluation stage. I agree with her. Her photos are compelling, succinct, and human. I thought someone would start a GoFundMe page when news about Jessie’s work appeared. My husband said, “Why don’t you do it?” So I did. 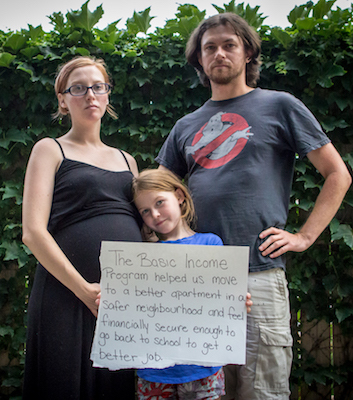 Check out the GoFundMe Humans of Basic Income page for all the info. Please contribute if you are able. And please forward to friends and acquaintances who you think may interested.